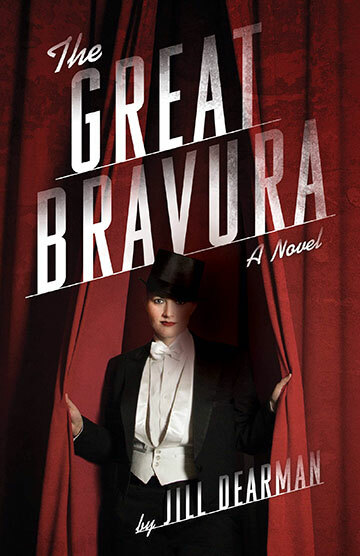 Brooklyn, NY – New York journalist and author Jill Dearman announces the release of her new LGBT historical mystery, The Great Bravura: A Novel (ISBN 978-1631529894). The book follows the success of Dearman’s highly lauded book for writers, Bang the Keys (ISBN 978-1592579143), a Penguin publication. Set in late 1940s New York City, The Great Bravura tells the dark tale of Bravura and Susie, who are partners in magic, best friends, and occasional bedmates. When the two performers hire the alluring Lena as a third banana to jazz up the act, Bravura falls madly in love. Lena believes in magic—and not just the rabbit-out-of-a hat kind. She encourages Bravura to believe in her own supernatural powers, and when Susie balks, things go south. When Susie disappears for real during a performance of the classic Disappearing Box act, prime suspect Bravura must move quickly to find her pal—hopefully alive. To prove her innocence, Bravura is forced to uncover the holes in her own story, even if it means incriminating herself, and her precious Lena, in the process. Journalist Dearman’s debut novel captures the pulse of this particular moment in the 21st Century, with its depiction of gay marriage as something that is natural, accepted, unquestioned, making it a relevant addition to contemporary literature. The Great Bravura is also a rollicking look at the life of the stage illusionists in mid-century New York. It provides noir fiction lovers with a dark magician’s tale wrapped in a Sapphic love triangle, peopled by the magically gifted and hard-boiled cynic, Bravura, her salt-of-the-earth partner, Susie, and the mysterious femme fatale, Lena. Told in the voices of all three women, the novel explores the themes of mysticism, surrender, corruption, and moral self-destruction, while celebrating the magical power of love to seduce and destroy those who allow themselves to fall under its spell. The Great Bravura is an LGBT noir mystery that takes place in New York City in the late 1940s. What inspired you to write a historical novel set in that time and place? My New York City cab driver father died under mysterious circumstances when I was 15, but until then he took me out driving every Saturday, often to the seedier parts of the city, and through him I gained an education in true crime. Both my native New Yorker parents were raised on movies. Dad loved violent noirs. Mom favored “women’s pictures.” I learned the most about love, life, and the New York City of their era through film noirs they both loved: Kiss of Death, Laura, The Sweet Smell of Success, and many others. Although The Great Bravura features a trio of women – the magically gifted and hard-boiled cynic, Bravura, her salt-of-the-earth partner, Susie, and the mysterious femme fatale, Lena – Bravura is the novel’s heroine. What’s special about Bravura and how did you come to choose her as the main character for your novel? The extremes of what we’ll do when taken over by passion fascinate me. Susie believes in hard work, and the craft of performance. Lena believes in magic and Bravura’s true mystical powers. Bravura’s lovers know who they are; she is driven to find out the truth at any cost. I wanted to deeply explore a protagonist who is tortured by her own ambivalence, who, despite her street smarts, and ardent love of women doesn’t understand the most important woman in her life: herself. Ultimately, Bravura’s uncertainty about reality and illusion, and which side of the line she stands on, leads to tragedy. There are strong elements of mysticism, corruption, and illusion, especially with regard to love relationships, in The Great Bravura. Why did you pursue these themes? Death and the physical vulnerability of all living things are the only real truths. In noir terms, those are the hard-boiled truths. Many ancient spiritual traditions point out that unquenchable craving for physical pleasure, material wealth and power, and immortality are at the root of all suffering. My noir characters, though highly stylized, illustrate how these illusory but of so damn human desires lead to illusion, and how self-delusion leads to corruption. What roles do real life historical figures from the worlds of art and mysticism play in the novel? What do you find the most fascinating about noir mysteries? Two words: desperation and desire. I don’t know about you, but deep down, when I really want something, or more truthfully someone, my body and mind feel like they are going to explode. Nothing else matters. True, there are laws of man, and biblical laws if you will, that stop us from acting on those desires – because we fear the consequences. But noir mysteries focus on characters who are so amped up by passion they delude themselves into believing they can beat the odds, and fulfill their mad desires–at any cost. You are the author of a number of nonfiction works, in addition to this novel. What would you like readers to remember most about you and your books? Perhaps that my books are all attempts to tap into the mysteries of human nature, using passion and humor as my guides. Let’s face it, without those things, life (and literature) can get pretty dull. Are you working on a new book and, if so, what can you tell us about it? It’s another noir mystery, set in New York City. But this time it’s the New York City of the late 1970s and of the not too distant future. Love. Murder. Time travel. The usual!